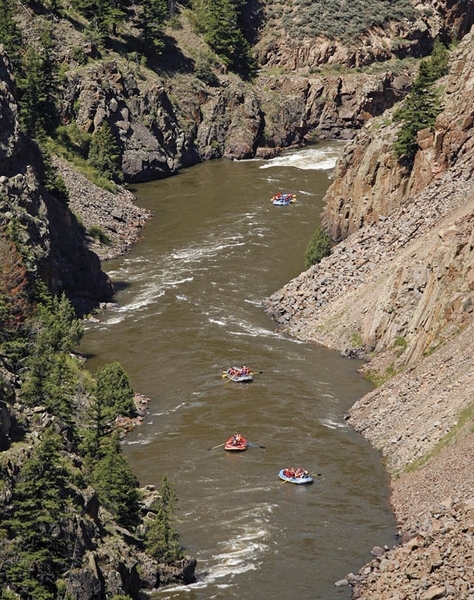 With the Colorado River flowing at about four times its normal level, several groups of private boaters ran into trouble near Radium last weekend. On Saturday, May 28, a private group of inflatable kayaks flipped, putting at least three occupants into the river around 1:30 p.m., according the Eagle County Sheriff’s call log. Two swimmers found their way to dry land quickly. The third kayaker swam for more than a mile-and-a-half before being discovered – washed up on the shore and unresponsive – by an unaffiliated raft full of rookie trainees from Adventures in Whitewater, according to Helena Powell, one of the company’s owners. The rafting company’s river manager Jason Cox, who was leading the training trip, attended to the man. He was roughly 21-years-old and wearing only a T-shirt and board shorts, Powell said. Cox found he had a weak pulse and labored breathing. The Adventures in Whitewater training group loaded the man on their raft and worked to warm him as they headed down the river. He soon became responsive and started shivering, Powell said. The rescue raft was met by a Grand County EMS team. Powell said it was the rookie crew’s very first training run of the season – and a memorable one at that. A second incident occurred on Sunday, May 29, when a train reported an overturned raft in the Colorado River approximately 2.3 miles north of Radium. Four people were in the river. All the swimmers got out of the water safely.